The recipient of the 2017 award for the best doctoral dissertation completed at a Canadian university in the field of Human-Computer Interaction is Dr. Michael Glueck. He completed his doctorate under the supervision of Associate Professor Daniel Wigdor and Assistant Professor Fanny Chevalier. 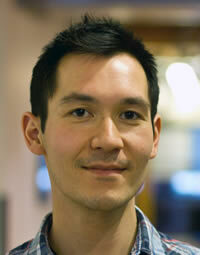 He is currently a Principal Research Scientist at Autodesk Research in Toronto. It is the third time a best Canadian HCI dissertation is awarded to a graduate of the Dynamic Graphics Project lab since 2010: Dr. Daniel Vogel (2010), Dr. David Dearman (2011) and Dr. Michael Glueck. (2017). Former U of T postdoctoral researcher Dr. Michelle Annett is a 2014 recipient of the award. Glueck's dissertation, Ontology-based Context in Visualizations to Facilitate Sensemaking: Case Studies of Phenotype Comparisons, explores the development of visualization technologies, with a particular focus on improving the understanding of very large data sets using ontologies. Particularly striking is the analytical framework he applies to underlying data, enabled by ontologies, and the understanding that framework provides. This had a dual impact: it produced tools that have been used to conduct and publish scientific work by clinicians and scientists, which has helped advance knowledge in fields such as neuroscience; more importantly, it made a series of important advances in the state of the art for information visualization and HCI. His bachelor’s and master’s degrees in computer science were also earned at U of T and his master’s thesis (A Model of Navigation for Very Large Data Views) was supervised by Dr. Wigdor. He received a Michael A. J. Sweeney "best paper" award for a co-authored HCI paper at the Graphics Interface conference in 2013, a best paper award and an honorable mention award for two papers at the ACM CHI 2016 conference, and an honorable mention for a paper at the IEEE VIS (VAST) conference in 2017. The award is named in honour of Bill Buxton, a Canadian researcher, designer, and musician who has done much to promote excellence in the field of HCI.